William and Mina Prindle at 2211 Greysolon Road—is one of the Zenith City’s more remarkable homes. As Prindle and others began developing Duluth’s residential area east of 21st Avenue East around 1900, he and Mina decided it was time to build themselves a grand home in the same area. 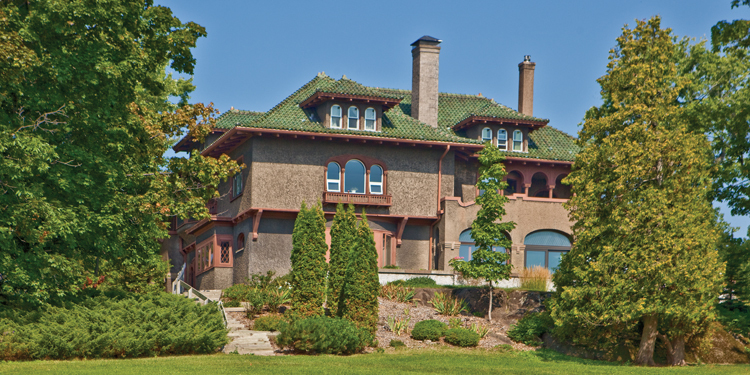 In 1904 they hired Duluth architect William Hunt, then with the firm of Palmer Hall and Hunt, to design them a grand mansion at 2211 Greysolon Road. Hunt created a Spanish Colonial Revival house for the Prindles. It cost the real estate baron and his wife $16,000, just over $400,000 today. For the interior, Mina hired two noted designers, furniture maker William A. French and interior designer John S. Bradstreet. French, a noted woodworker, designed the cabinets for Thomas Edison’s phonographs. Bradstreet, a Minneapolis Arts & Crafts specialist, did the lion’s share of the work inside the Prindle home. The Prindles were apparently well acquainted with Bradstreet before the house was built: E. A. Merrill, Mina’s brother and William’s business partner, purchased the house at 2116 Second Avenue South in Minneapolis that Bradstreet had built for himself in 1890, but had never lived in. According to the Minneapolis Institute of Design, the Japanese elements were inspired by Bradstreet’s many trips to Japan. There he learned the “sugi-finished wood” technique Maus refers to above. On one trip, he had learned about a technique called jin-di-sugi, in which cypress wood is buried for many years and then dug up. The rot and decay created interesting patterns. Bradstreet discovered a way to produce the same effect much faster, using chemicals. This treated wood became his trademark, and he used it for all the paneling and wood furniture in the Prindles’ living room. The Institute also describes the other Japanese elements Bradstreet employed in the Prindle living room: a table in the living room was known as the “lotus table,” carved to resemble the water lily prevalent in Asian art. Other chairs and tables displayed carvings of flowers and imaginary creatures. The room included a picture of a Japanese woman and a Japanese birdcage. Chester and Clara Congdon were also apparently impressed by both French and Bradstreet, hiring them to work on the interior of Glensheen. Bradstreet is responsible for the famed mansion’s Breakfast Room and most of the bedrooms on the third floor. Over the years Prindle also acted as president of the Prindle-Lachman and Prindle-Jones Company, both real estate companies. He also served as vice president of the insurance firm Kirby-Griggs Company and vice president of Superior’s George G. Newton Company, which also handled general real estate, mortgage loans, and insurance. William Prindle died in 1944. Mina outlived him by nearly twenty years, just missing her 100th birthday in 1963. The house apparently stayed in the family until 1981, and most of Bradstreet’s work was still intact even then. In 1981 Wheaton Bissell Wood, the Prindle’s grandson, arranged for the Minneapolis Institute of art to remove paneling, fireplaces, and furniture from the Prindle home. The Prindle living room was then reconstructed at the Institute as an example of Bradstreet’s work. It is still exhibited today. The Prindle house was then purchased by the Franciscan Sisters of the Eucharist, who used the house as their home as well as the home of the John Duss Music Conservatory, which taught music to students of all ages. The conservatory closed in June 2009, but the sisters continued to live in the house until recently. In March of 2013 the Prindle home was purchased by Advocate Community, Inc., for just under $1 million. The organization planned to use the house as a drug and alcohol treatment center, which caused a stir among nearby residents.